When I was a little girl, my family and I lived in Borough Park, a low-income Jewish neighborhood in Brooklyn. My grandparents, economically marginalized people with large families, having been hastily transplanted some 30 years earlier from stetls in Poland and Russia, had brought little with them to the “goldene land”—pretty much just each other and the clothes on their backs. And their stories. Some of the stories were heartbreakers—such as the one my father told me about when the family had to sell their cow to the butcher in order to get the money for them to leave. As the butcher led her away, my father recalled, she turned her head to the family and mooed her goodbye. The traditional stories were often hilarious, with each having an embedded “lesson.” In one, a poor peasant with a large family, including his wife, many children, and his mother-in-law, live in a tiny house in a tiny stetl somewhere. All he wants is peace and quiet. So he enlists the aid of the rabbi, who, after lots of beard-tugging and heavy thought, tells him to bring the dog and cat inside. When the noise worsens, the rabbi tells the man to bring in the cow, then the goat, then all the ducks and chickens. When the man can no longer bear the chaos, the rabbi tells him to put the animals back outside. After which the man enjoys his newfound peace and quiet, and finds out—as listeners already know—that life could always be worse. Monica Brown’s Clara and the Curandera / Clara y la curandera was inspired by this traditional Jewish story. Here, a grumpy little girl, one of eight children, is “tired of not having any space or time” to herself. She doesn’t like to share, doesn’t like to do her chores, and doesn’t like to read. Overwhelmed, the child’s mother sends her to the curandera down the hall. But, rather than being taught how to survive the chaos of everyday life, Clara is given more tasks than she’s ever had—which indirectly teaches her that she has value in her community. In the end, when the curandera allows the transformed Clara to resume her old habits, she chooses to be helpful to everyone, and—while her family, friends and neighbors appreciate her for this newfound generosity—the curandera goes on to help another child with a problem. Brown’s story has little left of the traditional one that inspired her—she’s flipped the time, the place, the characters, the cultural elements—and even the lesson learned. Yet, Brown is a talented storyteller and her version has a genuine feel to it, it’s got good rhythm, and it’s respectful of Mexican American elders, children, and the community in general. And, similarly to the “original,” the story is nuanced rather than “teachy-preachy”—the words show rather than tell. 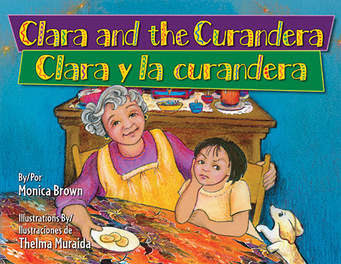 Young listeners will enjoy how Clara and the Curandera gently conveys its lessons. Unfortunately, Muraida’s pastel artwork, on a palette of mostly blues, browns and golds, sabotages the story. Although the facial expressions of the main characters—Mami’s exasperation, Clara’s grumpiness, and the elderly curandera’s wisdom—are portrayed well, there are too many errors, ethnically and culturally. There is no father in the text; rather, it appears that Mami is a single mother of eight. Yet, the father appears as a small figure in the background of two illustrations. In the text, the family and community are Mexican American, but except for the curandera’s apartment (with candles, carved boxes and frames, and patterned tablecloth), nothing in any of the illustrations reflects the community’s culture. Rather, every room, hallway, and street appear to be bare; and in Clara’s apartment, which is home to her large family, nothing is out of place and there’s not a speck of dirt anywhere, not even a spot of grease on the oven. Everyone—even the neighborhood children—has the exact same (light) complexion. And several of the artistic details—two of which separate the English from the Spanish text—are unforgivable. In one, Clara, hauling a heavy, stinky bag of trash, imagines herself enslaved. She is painted as dark. In another, a mini-portrait of Mami, Papi and the eight children, all of them are painted as dark. And in a third illustration, while Clara’s favorite doll is Mexican, the curandera gives her a new doll. This doll is white. Behind the substandard art and boring design is this question: What kind of damage does this type of illustration inflict on children, especially the children whose cultures are being depicted? The lack of editorial attention, direction, and cohesiveness here are unacceptable. Our children deserve much better than this. Unfortunately—despite the fact that Monica Brown is a very good storyteller—Clara and the Curandera / Clara y la curandera, as a picture book, can’t be recommended.